Part of my own personal development at LandWorks has been discovering that another’s personal crisis has to be seen from their perspective, as much as possible. Often just listening is far better than clouding the issues by unhelpfully sprinkling guidance all over the place like some demented fairy godmother (DFG). The two of us, or as Bobby saw it the three of us, had found a quiet corner of the field to have a chat. We were coming from two very different perspectives. 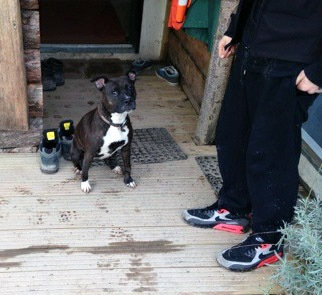 I saw Bobby as now homeless and Bobby – well, he’d found unconditional love! Rocky appeared to have a dodgy back leg. As is already clear I am no dog expert but luckily the day’s full house of trainees at LandWorks were all very knowledgeable…8 of 10 prisoners who expressed a preference, choose a Staffi Bull Terrier every time! Complete silence…broken by Bobby’s retort: “Who the f#@k is going to pay for that? I’ve spent last of me money on pedigree chum”, jangling a bag of cans at me. Our panel of Staffi experts had been deep in conversation and now seemed convinced that Rocky was previously known to some of them as “Bella” (…I just kept quiet). Bella was known for her deformed back leg and a similar dark patch over her left eye. A photo was taken, I texted said photo to a man in Torquay…home found, Bella to be reunited and Bobby it was agreed could visit Rocky as often as he liked. So, just a tricky call to the B&B – and off we go again.